in-even if it did sometimes drift into the law's gray areas-had just become clearly criminal. She would never have agreed to take this infant if what Florence had just told her was true. and stuffed them in with the baby. If she could hide out long enough, maybe she could get the baby to safety. Before she reached the garage door, she heard a car out front. Peeking through the curtains, she saw him get out. His car blocked Pia's getaway. Biting back panic, she realized she'd have to escape through the kitchen door. She exited quickly with the baby and stood on the porch. She knew she had to hurry, but which direction? Hed see her on the road. Her only hope was through the thigh-high drifts across her backyard and into the woods. Her cross-country skis were propped against the side of the house. She shouldered into the baby backpack, slung the diaper bag over that, and then snapped on her skis. She set out across the frozen landscape. 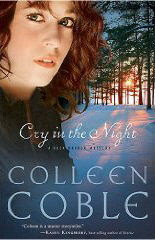 Her muscles were warm by the time she reached the edge of the woods, and her breath fogged the frigid air. But she'd reached the path other skiers had used, and the going would be easier. never going to make the sanctuary shed hoped for. He hadnt seen her yet though. She hoped he'd lose her tracks on the more highly trafficked trail. Tension coiled along Pia's spine as she whirled and looked for a place to hide the baby. There-a fallen pile of logs had enough space under it to hide the infant. She slipped out of the backpack, and a crumpled piece of paper fell from her pocket. She wedged the carrier under the logs. She layered several insulated blankets around the tiny girl. At least the child was sheltered. His narrowed gaze nearly cut her down, "Where's the baby?" She tipped up her chin. "Im not going to be part of this." He grabbed her arm and twisted it. "Where is she?" Reeling from the shock, Pia's shoulder shrieked with pain. Still, she held his gaze defiantly. "Where you'll never find her." "I saw you carrying her!" He slapped her, then slapped her again. Both hands moved to her shoulders and he shook her. "Where is she?" Pia's cheeks burned. Her head fopped with the violence of the shaking. Then he shoved her, and she was falling, falling toward a broken tree limb that jutted from the ground like a giant spear. I read the first few pages. Very engaging right from the start!